Regular breakouts are bad enough, so it hardly seems fair when scalp acne and breakouts along the hairline show up, too. Don’t be discouraged: There are simple tricks and proven solutions to keep those pesky scalp pimples and forehead bumps from appearing. We share what’s worked for us based on scientific research, not hype. Surprise: The hair-care products you use can be a sneaky cause of why you’re breaking out on your back, neck, chest, and hairline. Styling products—especially pomades and waxes—are the biggest culprits, but moisturising shampoos and conditioners can contribute, too. Shampoo and condition your hair first and rinse well, tilting your head backward under the shower head. Tilting downward (so the water rushes over your face) can deposit “clingy” haircare ingredients on your skin. Follow with your gentle, fragrance-free body wash, paying attention to your neck, upper back, chest, and hairline. Use only the amount of conditioner you need. Excess conditioner doesn’t help your hair or skin. When you apply styling products, take care to avoid the skin around your face. Love hairspray? Protect your skin from its pore-clogging holding agents with a clear, plastic face shield available online. The Soft ‘N Style brand is highly rated. Avoid putting creams, waxes, or pomades on any hair that touches your face. Silicone serums aren’t a problem. Silicone is porous, so it won't suffocate your skin or cause scalp bumps. Forehead acne should be treated the same way as acne on the rest of your face. The exception? If you’re dealing with clogged pores, not with acne. You’ll know the difference because acne results in raised, red bumps (pimples) that can ooze fluid and feel uncomfortable; clogged pores, on the other hand, aren’t red, don’t swell up, and rarely cause discomfort. If it’s only clogged pores, skip Step 3 below. Cleanse skin with a water-soluble face wash designed for acne-prone skin. Use a BHA exfoliant to remove dead skin, unclog pores, and help prevent more zits. Apply a benzoyl peroxide solution. Benzoyl peroxide is considered the gold standard for preventing acne breakouts, clearing pimples you have now, and reducing redness. What About Pimples on the Scalp? The same haircare products that trigger pimples and clogged pores on the forehead and hairline can cause problems on the scalp, too. But scalp pimples are tricky; for example, applying benzoyl peroxide can help, but it can also bleach your hair. A BHA exfoliant can work wonders, but the typical lotion, cream, or gel form isn’t easy to get directly on the scalp. Be sure your shampoo rinses cleanly. Avoid conditioning and “2-in-1” formulas. If you use conditioner, apply it only to the ends of your hair and rinse well. Use a cotton swab to apply a liquid anti-acne exfoliant specially formulated for the body. Leave it on your scalp overnight, and shampoo your hair in the morning. Don’t apply any creamy, thick, or paste-like styling products near the scalp. 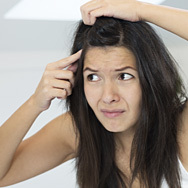 If you have scalp acne that’s red and swollen, be extra-gentle when combing or brushing your hair. See your dermatologist if your scalp acne doesn’t respond to over-the-counter products.